What type of oil should I add to my Yokebe Classic shake? Vegetable oil with a high level of unsaturated fatty acids (sunflower, safflower or grape seed oil). Why should I add oil to my Yokebe Classic shake? Can I drink tea and coffee while on this diet? Can I have snacks whilst using Yokebe? If so, what types and how many? All products in the Yokebe range are gluten-free. Is Yokebe suitable for Vegans? Yokebe is not recommended for Vegans, as it contains lanolin-derived Vitamin D.
Yes – Yokebe is suitable for Vegetarians. I’m lactose intolerant. Can I use Yokebe? Yokebe is lactose-free if prepared with water or lactose-free milk. If prepared with water, Yokebe only has 180 kcal per serving. In this case it doesn’t substitute a full meal. Will Yokebe interact with my medication? Yokebe is a meal replacement, it is not known to react with medication. However, we strongly advise you talk to your doctor before starting on any diet program if you take prescribed medication. From which age can I use Yokebe? Yokebe is for adults who want support to lose weight or want to maintain their weight. The ingredients in Yokebe can be consumed by older children but the product formulation has been designed specifically for adults and has not been adapted to the needs of children. The use of Yokebe by children should be discussed with a doctor. Can Yokebe be used by people with Diabetes? Yokebe may be used by patients with diabetes, but solely under the supervision of a medical doctor. As Yokebe contains sugars (including honey, fructose and dextrose) and proteins, it is important that glycaemic levels, electrolyte levels and renal function are properly monitored. Please consult with your doctor for more information. Is Yokebe suitable for women who are pregnant or breastfeeding? We always recommend that those who are pregnant or breastfeeding should seek advice from their doctor before starting a diet. Should I exercise during my Yokebe Diet? Exercise is good for your health and your well-being. In order to lose weight, it is important to achieve a negative energy balance which means your body should burn more calories than are consumed through your diet. As one Yokebe shake is between 273-302kcal (depending on flavour), you can achieve the desired negative energy balance without exercise when replacing two of your three meals a day with a Yokebe shake. However, exercise can bring additional weight loss benefits, allowing you to reach your ideal weight faster. We recommend everyone should have moderate physical activity every day to stay healthy. Don’t hesitate to do a brisk walk 30 minutes per day or use the stairs instead of the lift. You only need to add oil if you are using the Classic Yokebe with Honey. The Chocolate and Strawberry powders have a different formulation which doesn’t require additional oil. The reason that you add oil is, it helps your body to absorb fat soluble vitamins. You only need to add half a teaspoon of vegetable oil to your shake, which you will not be able to notice when you have shaken it up with your shake. The instructions say to add oil to the Natural Honey shake, but not the Chocolate or Strawberry Shakes. Why is this? 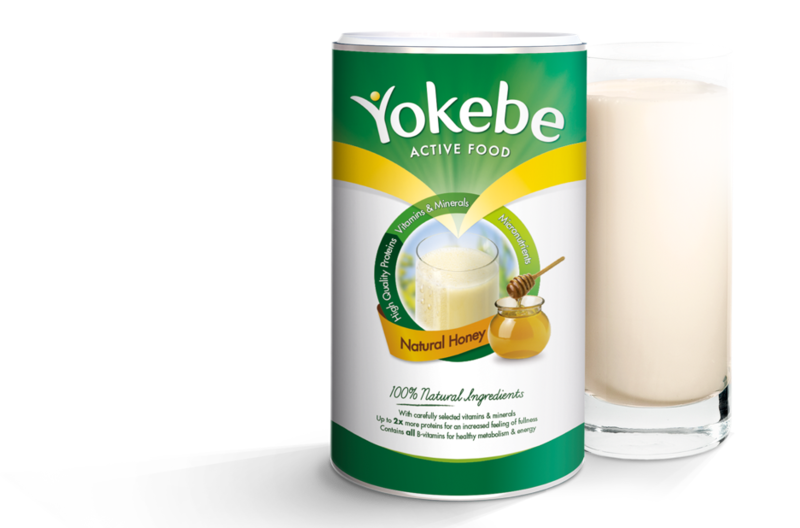 Adding oil to your Yokebe Natural Honey shake allows your body to absorb the necessary fat-soluble vitamins and provides you with the additional nutrients you need as part of a meal replacement. You do not need to add oil to the Chocolate or Strawberry Shakes because they have a slightly different formulation to the Natural Honey Shake and contain the necessary fats required. Why is it recommended to use oil in the preparation of a Yokebe shake? The body needs fats for optimal care alongside carbohydrates and proteins. The recommendation is to use vegetable oil with a high level of unsaturated fatty acids such as sunflower, safflower or grape seed oil. Can I pre-mix Yokebe in the morning and use it in the afternoon? Yokebe tastes the best when it’s freshly made. However, you can prepare Yokebe a few hours before consumption. Keep the shake cool until use and shake again briefly before serving. Can I heat my Yokebe shake? We recommend not heating it as it can destroy the vitamins in the shake. Yokebe tastes its best when shaken and served cold or at room temperature. Is Yokebe clinically proven ? Yokebe is a meal replacement. Meal replacements have a proven clinical efficacy for weight loss and weight maintenance and are well accepted by health care professional as a weight loss method. Everyone has different calorie requirements depending on their shape, genes, daily activity, age and gender. The important thing to remember is that you are creating a calorie deficit in order to facilitate weight loss, the greater the deficit the more weight you will lose. But is it important to ensure you are getting the macro and micronutrients your body needs. Our general guideline is to snack on fruits and vegetables when you feel hungry between meals. Non-starchy vegetables (this does not include peas, corn, sweet potato and butternut squash) are unlimited and fruits should be limited to 3 a day. Very low calorie meals like thin soups are allowed if you feel the need (recipes and ideas for other low calorie meals can be found here ). Why do you burn fat with Yokebe? Using Yokebe as a meal replacement helps create a calorie deficit. Since these calories are suddenly not available, the body takes them out of its fat reserves. At the same time, the body continues to be supported by the high quality protein, which supports muscle mass. Will I gain the weight back when I come off the Yokebe Diet plan? The great thing about losing weight with Yokebe is that you lose fat but the high level of Proteins means you retain muscle mass and keep your metabolism active. So you should avoid the yoyo effect. The Yokebe diet is a good moment to ‘reset’ and learn new nutritional habits, it is important to continue with a healthy lifestyle & eat sensibly after your Yokebe diet to avoid gaining weight again. You can continue to use Yokebe as a weight management tool after you reach your goal, for example by replacing lunch with Yokebe when you’re going to have a big dinner that evening.